During Uganda's era of British colonialism, settlement by Europeans was not allowed, and today there are few Caucasians in Uganda. The term for whites is muzungu (plural bazungu), and Caucasian visitors should get used to hearing it shouted out by children in every corner of the country. It is not a derogatory term per se, so smile and wave in reply - if you can do this over and over again. Otherwise, ignore. 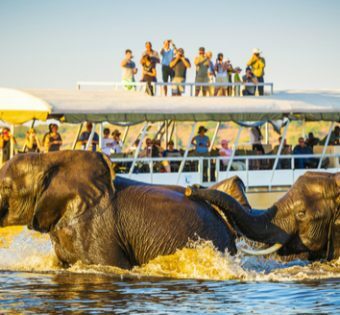 Uganda is accessible and affordable, but not up to the high tourism standards of more mature destinations such as Kenya or Tanzania, much less South Africa. This gives it more edge, more authenticity, and less predictability. This does not mean danger, rather greater opportunities for delight -- and frustration. This is real Africa, the dirty urban bustle of Kampala bursting at the seams then giving way to lush subsistence farming and small villages. Roads are rough, people are friendly, everything seems to have a smell all its own, and not everything moves according to schedule or to plan. Most travelers come for the gorilla Safari, but other major draws are the chimpanzees, birding, trekking the Rwenzoris, and visiting the source of the Nile River.